Bandolier holsters can be related with that of straps of ammunition worn by armies in the past during wars. But instead of carrying bullets, bandolier holster usually carries with it weapons such as small guns or pistols, allowing the police or even civilians to carry their weapon hidden in plain sight, called concealed carry. A bandolier holsters is also knows as an across the chest holster. 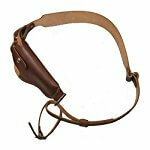 In activities, such as hunting a bandolier holster is surely the best shoulder holster you can carry. Made by the Hunter Company, this bandolier holster is the best shoulder holster out there, as it is made from high quality leather that will surely help you in in carrying your weapon without getting a suspicious eye on you. 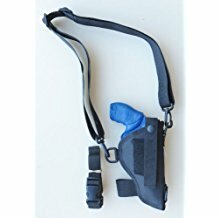 This holster is made for right hand use, and its harness can be adjusted to either tighten or loosen the attachment to your chest area. Although the harness is worn across the chest, it does not slide towards a horizontal position as its bottom contains another strap which can be fastened around for additional support. With these qualities, you can use it for activities such as hunting, because you will be sure that even if you go running chasing your target, your weapon would be secured in place across your chest. This is better than the traditional way of carrying your weapon by hand. This bandolier holster is made by Holsterman. This holster allows you to use it as a multi-point wear, and it is not limited to just that as you can also use it as a belt wear. There is a shoulder strap measuring around 1.5”, which you can adjust for a better fitting. 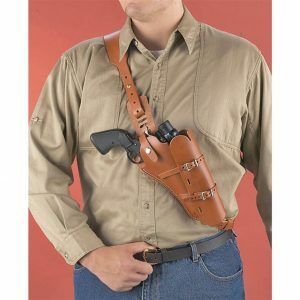 For you to be able to secure this holster in its designated position, there is a 1” belt that comes with this holster. With its thumb-break retaining snap, you can hold the weapon in position at ease. This holster can be worn across your chest, or under your arm. Can be used for the right hand or the left hand. Once strapped in your body, you can use it for activities such as hiking, hunting, and fishing, proving that this holster holds tight. Can be used for varying positions of carrying weapon. Some users may find the lower ring of the holster strap is too low, which could make the weapon to flip or move out of place. 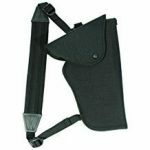 This holster is intended for the right hand use, and can be used in carrying large weapons for activities such as hunting. There is an adjustable strap as well as loop that can be fastened around the waist for optimum attachment to its place. The shoulder strap is also padded, making you avoid the itch and skin marks made by too-tight straps upon contact. There is a removable and adjustable flap to protect the weapon from the weather. The flap prevents dusts from entering or making contact with the weapon. You can carry the holster through several positions such as under your arm or across your chest or back. The snap, when closed or opened, gives a sound that makes the conceal carry compromised. In choosing the best shoulder holster, you should try Hunter Company Leather bandolier holster, because not only it fits a lot of weapons, but it is also made from premium quality leather, making it durable and strong enough to hold such a lot of hand guns. Since this is a bandolier holster, you can use it for strenous activities such as hiking, hunting, fishing, and even trekking since you are sure that the holster is strongly attached to you, keeping your worry out of the picture. In addition, a bandolier holster is better to use than other types of holster such as pocket holster when it comes to carrying larger weapons because you will be using your chest a a full support, not just your right or left pocket which would be annoying as you go in your journey. Compared with the federal bandolier field holster, the Hunter Company Leather bandolier holster is secured and has no possibility to flip in any direction as you move. When compared with balckhawk, the Hunter Company Leather bandolier holster does not make a sound due to the snap closure, which is crucial especially if you are hunting and your target has a very sensitive hearing. What is a bandolier holster? Bandolier holster originated from the army in the past world war, where they usually wear a clothing like belt across their chest, around the shoulders, or under their arm. This belt contains ammunition such as bullets for their ease of use. At times of battle, soldiers would need to act fast, like fast reloading of their weapons with bullets. Instead of placing their bullets inside their pockets, they designed a clothing that when worn across the chest, would hold their bullets for easier and faster access. Right now, the bandolier holster evolved to carry the weapon itself, such as small hand guns. For the bullets, this holster can also provide a place for magazines. Several designs have since then made for the varying preferences of the users. Some considerations are how the users would like to carry their weapon with them, or where they plan on carrying it, such as hiking or hunting activities. How to wear a bandolier holster? Bandolier holster can be worn across the chest, under the arm, or on the shoulders down to the side of the body. There are lots of models to choose from, based on the user preferences. Additional features are also available to secure the weapon and the holster itself on the body, so that there would be no need to worry if the holster would go out of its place. Bandolier holster has been proven to be helpful at times when you prefer to carry your weapon across your chest, under your arm, or on your shoulder. 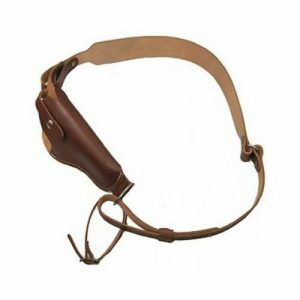 Through additional features such as belt straps, you can fasten the holster more securely to your body, so you can still enjoy doing strenuous activities like hiking, hunting, and fishing, among others. Usually, the use of this type of holster depends on your preference on how you want to carry your weapon with you whenever you go, because if you do not want to use bandolier holster, you can opt to use other types such as Inside the Waistband (IWB) holster, or pocket holster. These other two types of holster can also allow you to do concealed carry, making no one know that you are carrying a weapon with you. If you are looking for concealed carry shoulder holster, then you can try models of your preference. But based on the appearance, bandolier holster also looks powerful and cool at the same time when worn outside the clothing. Although people who want to go on concealed carry choose pocket on IWB holsters, a lot of hunters still use bandolier holsters as their preference. This is because they prefer to go hunting using a hand gun, and what more could hold their weapons better aside from bandolier holster? The said holster can also have secure slots for the ammunition. 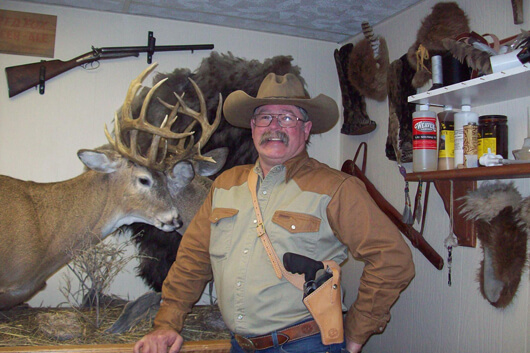 Hunting rifles can be a huge weapon to carry around with you, which is the reason hunters prefer smaller weapons for hunting. When compared with pocket or other holsters, bandolier holster suits hunting better, as it is easier to place and draw your weapon if it is positioned on your chest than inside your pocket or jeans. If your target is fast, drawing your weapon faster is necessary. This is where bandolier holster can help you. This type of holster is also preferable if your weapon is heavy, because you have all your chest supporting it, in contrast with that of the pocket holster, where you would just feel like something heavy is growing in one of your pocket. Carrying position is crucial especially if you are planning to take a hike or hunt, where you should conserve energy not for carrying your weapon, but for the activity itself.